Hwaseong-si in Gyeonggi province bears the spirit of King Jeong-jo’s devotion to his father who is called the Crown Prince Sado. And among the counties of the city Hwaseong, Bongdam-eup is renowned as a village of filial piety. There is Hyoja-mun (which is a kind of gate) commemorating Hyoja [a devoted son] who moved heaven and found carp and cucumbers in the middle of winter when he looked for them for his sick parents; and there is also Hyoja-gak(which is a kind of tower) commemorating a faithful son who killed a tiger which had eaten his father. On January 21, a few days before the Lunar New Year’s Day, the Intl. WeLoveU Foundation held a consolatory party for the senior citizens living alone in Bongdam-eup, Hwaseong-si, Gyeonggi Province. It was held to follow the will of Chairwoman Zahng Gil-jah who said, “Although it becomes more difficult to live as economy get worse, we need to share more with our unfortunate neighbors, even dividing a grain of bean into four.” The reason why the foundation held the event in the village of filial piety was to enlighten the spirit of devotion to our parents, which is now disappearing, and to take care of the senior citizens who live in difficult situations and feel lonelier on holidays like the Lunar New Year’s Day. During the consolatory party, being held as part of the “14th Love Sharing Event Greeting National Holiday,” Chairwoman Zahng Gil-jah, Chief Director Lee Gang-min and other board members and the foundation members served the senior citizens, volunteering to become their one-day sons and daughters. They served the senior citizens with festive food, massaged them and talked together with them. Some senior citizens were living alone for some reason even though they had their children; and many senior citizens said that they were happy as if they had seen their own children. Their words touched the members’ heart deep. 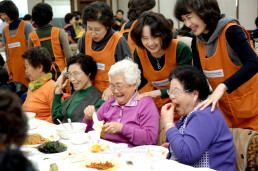 The members shared the love of a family with the senior citizens as if they had served their parents in their hometowns. After finishing the party, Chairwoman Zahng Gil-jah gave a “Rice Cake and Dumpling Soup Set” and “Tuna Gift Set” to the senior citizens one by one, wishing them to live healthy and happy lives. Ryu Jeong-im (93), who was the oldest in the senior’s house, was very excited and said, “I can’t be happier.” The members helped their return to their homes, carrying their gift sets. Seeing the senior citizens delighted with small things, the members said, “We received many things from them, rather than gave them.” When we share, we become abundant: It is love, and the spirit of a feast.